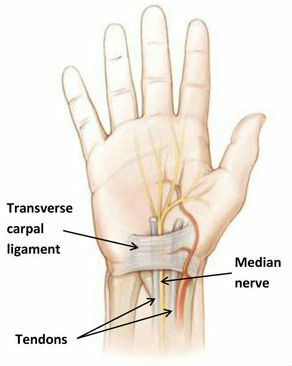 It is a condition in which the median nerve compresses and causes pain.It causes weakness, tingling, numbness and other problems in the median nerve in your hand.Carpal tunnel is essentially bones and ligaments that are present at the base of the hand,and it is here that most of the symptoms associated with the disease are more felt.These symptoms and problems are more often than not, known to start off quite gradually and significantly increase as the night approaches. Overextending the wrists must be avoided if you suffer from the carpal tunnel syndrome or this condition could be made much worse than it already is. 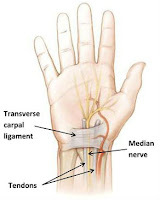 There are several treatments to cure Carpal Tunnel Syndrome,but the most popular seems to be yoga. There is also the option of surgery,but Ayurveda backs up the claim that over time,the carpal tunnel syndrome can be cured by practicing yoga regularly. Try an ice bath on your wrist every 2-3 hours to experience relief.If it pains at night,try shaking your wrist or hanging it at the side of the bed to get relief. Wrist braces are another option and a good 2-3 weeks in them can help cure them for good. Practice yoga on a daily basis! Try steroids for swelling after doctor consultation. Self-care is super essential for anyone suffering from this syndrome. Stretch your hands frequently between working and take breaks. Watch your posture constantly and do not slouch as that can compress the nerves in your neck that ultimately affects the nerves in your hands. Try to keep your wrists and hands in a straight and neutral position. Use less force and keep your grip relaxed. Hope this article stands you in good stead and is able to help you out with more information about the Carpal Tunnel Syndrome! Is Obesity Responsible For Diabetes? List Of 10 Medecines Banned By WHO(World Health Organization) In Last 10 Years: All the drugs are first tested on animals for their safety and efficacy as well before they enter the market. But sometimes, the adverse effects of some medicines are noticeable only when they are used by the general population. Thus, it is the leading factor behind withdrawn from a class of drugs by WHO or world health organization. It not only restricted the distribution and marketing but also manufacturing of such medicines. Some drugs caused unexpected adverse effects and created lots of risks to your health. Further, the reason was the higher expansion of producing drugs still it was not beneficial and less demanding. Here is a list of medicines ban by WHO in last ten years.